Top Of The Foshay Tower, Droid Shots, Northern Spark, Minneapolis, Minnesota, June, 2012, photo © 2012 by QuoinMonkey. All rights reserved. It was 4:45am when we walked into the Foshay Tower lobby, hoping to catch the sunrise from the 30th floor observation deck. We had stayed up the entire night of June 9th for the second Northern Spark; it was now June 10th. 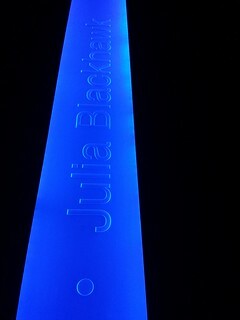 After a random tweet from the Northern Spark app, I won a Jump The Line At The Foshay prize, a gift that proved fruitful. We walked straight to the front of the line and flashed my Droid screen toward the guard. “Wow, that’s cool. 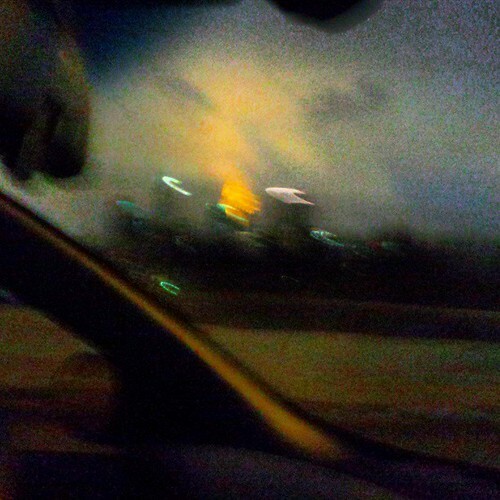 Off you go,” he said, shooing us in the direction of the packed elevator. My stomach dropped on the ride up; the tower view to the east took my breath away. The light was just beginning to change. The deck was crammed with Northern Sparkers, waiting for the sun. 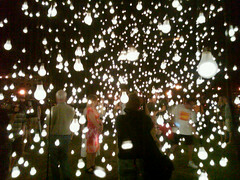 It was the perfect ending to the Nuit Blanche, a community shared art event for the soul. 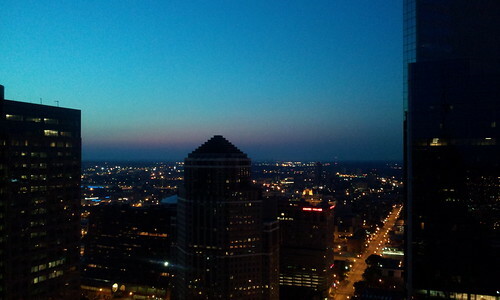 Sunrise on top of the sky; a tour of the Foshay museum. Details. Details. Details. Not just tree, what kind of tree. Not just building, what kind of building. A Minnesota icon, built to last, still inspiring sunrises after all these years. Construction began in 1927 & ended August 1929. Built completely by all-union labor. Foshay Moon, Droid Shots, Northern Spark, Minneapolis, Minnesota, June, 2012, photo © 2012 by QuoinMonkey. All rights reserved. Minneapolis At Night: Crossing The Mississippi, Droid Shots, Minneapolis, Minnesota, April 2013, photos © 2013 by QuoinMonkey. All rights reserved. Roadrunner Records – 12/365, Archive 365, Kingfield neighborhood, Minneapolis, Minnesota, March 2009, photo © 2009-2012 by QuoinMonkey. All rights reserved. 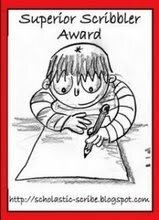 Not likely to provoke dissent or offense; uncontentious or inoffensive, often deliberately so: “anodyne New Age music”. A pain-killing drug or medicine. Something that soothes, calms, or comforts. 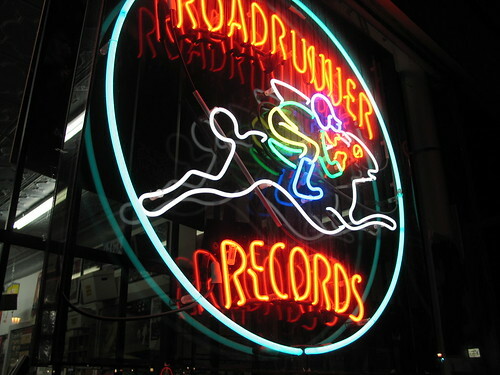 Stop into Roadrunner Records, then head across the street for coffee and baked goods made from scratch. Local in motion. Night On Fire, BlackBerry Shots, photo © 2011 by QuoinMonkey. All rights reserved. 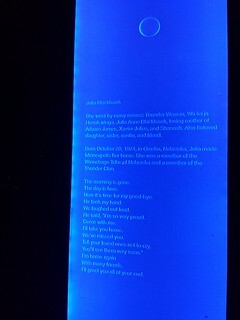 Original BlackBerry photo June 2011, part of Northern Spark — Twin Cities Nuit Blanche. Northern Spark 2012 begins next weekend in the Twin Cities at dusk on Saturday, June 9th and ends at the crack of dawn, Sunday, June 10th. Northern Spark is a free, dusk to dawn, participatory arts festival that presents visual arts, performance, films, and interactive media. 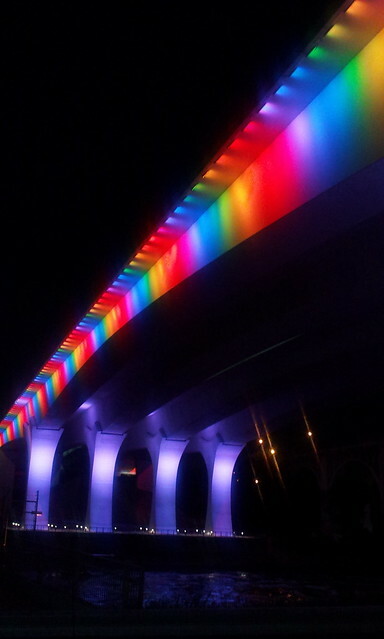 Tonight at the Stone Arch Bridge in Minneapolis we plan to attend the Pre-Spark Bridge Lighting where planners will flip the switch for Northern Spark’s signature artwork, Robin Schwartzman’s THINK AND WONDER, WONDER AND THINK. They will also be giving out festival guidebooks to preview before June 9. 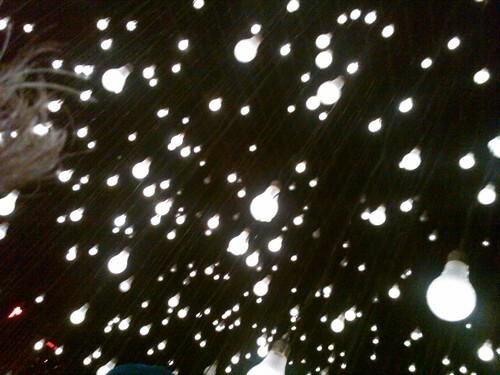 Last year’s inaugural Northern Spark was magical. In 2011, over the course of the night, there were 50,000 visits to 100 projects by more than 200 mostly local artists at 34 venues in collaboration with 60 partner organizations and sponsors. 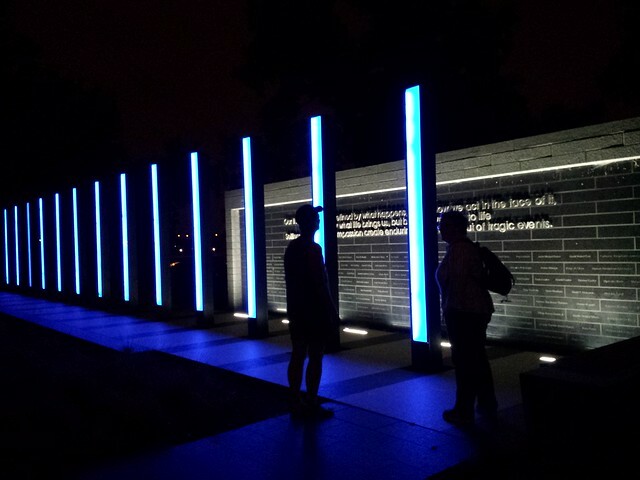 I have listed a few of the places we visited in 2011 and a little history of the Nuit Blanche (“white night”) movement in the piece Northern Spark — Twin Cities Nuit Blanche. The three photographs in this piece were taken while I was standing in the middle of Jim Campbell’s Scattered Light installation, part of Northern Spark 2011. In Annotated Artwork: The Making Of Jim Campbell’s ‘Scattered Light‘, Jim says moving from 2-D to 3D art is about “exploding an image, tearing it apart, and spreading it out.” His tips: 1. Pick a spot 2. Grab Source Material 3. Turn it into code 4. Create depth 5. Consider the planet. 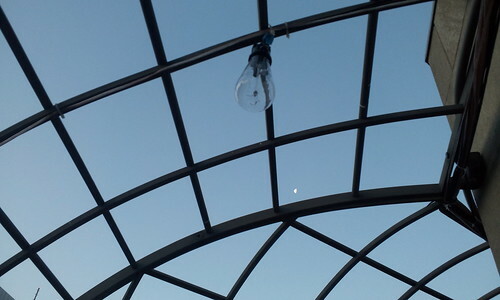 Honoring point 5, he and his assistants revamped thousands of standard lightbulbs, sawed them open, stuffed them with LEDs, and glued them back together, making handmade, unique, energy-efficient hybrids. 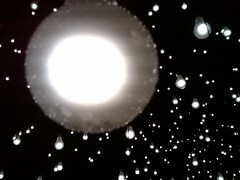 I am looking forward to Northern Spark 2012. At the Northern Spark website, there is a Planning Your Night page with a full list of events, including a link to download their new Northern Spark mobile app. We’ve already got ours loaded on our Androids. I only hope there is enough time to make all the events we’ve listed. It’s perfect for all of our fellow NightOwls! Hope to see our local readers there! If you can’t make it, you can follow Northern Spark on their Facebook page and at Twitter @Northern_Spark #NSPK. Out Of The Darkness (L), #NorthernSpark – Scattered Light by Jim Campbell 23/52 (R), BlackBerry Shots, photo © 2011 by QuoinMonkey. All rights reserved. Original BlackBerry photos June 2011, part of Northern Spark — Twin Cities Nuit Blanche. “K” Is For Kramarczuk’s, BlackBerry Shots, Minneapolis, Minnesota, December 2009, all photos © 2009 by QuoinMonkey. All rights reserved. 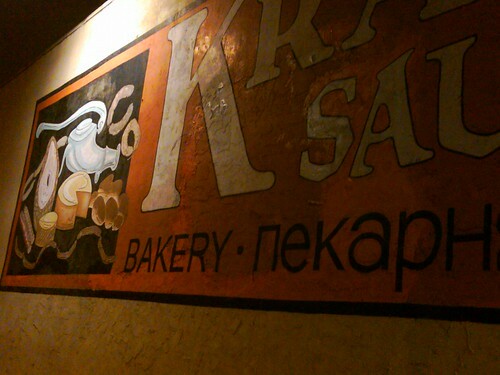 We stopped at Kramarczuk’s Deli last week to take a few photographs after Christmas shopping. Wasyl Kramarczuk and his wife Anna traveled from the Ukraine to the United States in the 1940’s carrying hope and a dream. In 1954, they combined Wasyl’s sausage making skills with Anna’s delicious cooking and baking to create Kramarczuk’s. Today it’s a Northeast Minneapolis landmark (read more at the Kramarczuk’s website). Northeast Minneapolis is one area of the city that still cherishes the neighborhood deli. 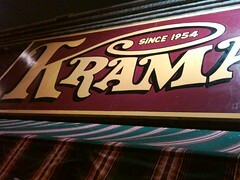 After moving to Minnesota in 1984, I settled in Nordeast where I quickly got to know Kramarczuk’s Deli. In fact, for 20 years I got my hair cut in the vintage East Gate Shopping Center nearby that was torn down a few years ago to make way for a grocery store and high-rise. What’s your favorite deli food? Check out Kramarczukl’s mouthwatering menu. I’ve had the Polish Sausage, the SauerKraut Dish, and the Ukrainian Meatballs. I love the Varenyky dumplings and the Borscht. It is hearty, stick-to-your-ribs food, perfect for the -0 degree December weather we’ve been having in the Twin Cities. Liz and I were drawn to photograph the mural on the side of the building at night. The letters in the side-by-side alphabets reminded me of our recent post on Runes, Oracles, & Alphabets. And the Runes remind me of the Holidays and Solstice. Today we’ll be putting up our tree. On Sunday, we’ll be celebrating Winter Solstice at the home of our friends. I’m excited because they recently created a labyrinth in their front yard. Walking from Winter darkness to the green of Spring. What do you want to let go of? What would you like to carry into the light. Kramarczuk’s – Since 1954, Kramarczuk’s Sausage Co. Inc., Kramarczuk’s Walldog Mural, Northeast – Making History Again, East European Deli – Old Kramarczuk’s Sign, Writing On The Wall, Kramarczuk’s At Christmas, BlackBerry Shots, Minneapolis, Minnesota, December 2009, all photos © 2009 by QuoinMonkey. All rights reserved.